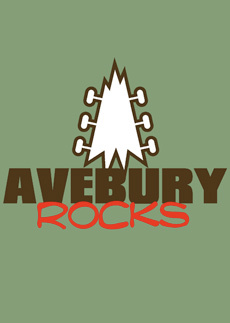 LHS in partnership with Rotary and Prospect Hospice held ‘Avebury Rocks’ on Saturday, 9 July 2011. An amazing event! 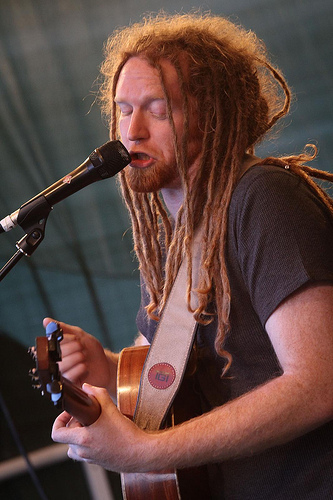 Nick Harper and other Love Hope Strength musicians undertook a 20 mile charity trek starting and finishing at one of the finest and largest Neolithic monuments in Europe at Avebury. We enjoyed the beautiful scenery of the ancient Ridgeway and Marlborough Downs ending at Avebury with an evening gig. The event raised funds for the Prospect Hospice as Nick Harper’s mother, Monica Weston who was well known locally as head teacher of St.Peters Junior School in Marlborough, spent her last days as a terminal cancer sufferer at Prospect. There is an extensive photo slideshow of the day available on flicker by clicking this link. Nick Harper has been kind enough to produce the following Google Earth walk-thru of the Avebury Rocks route. I’ve walked the Avebury Rocks route and taken a few pics. I thought there will be some of you out there who want to know what they’ve let themselves in for and others who want to see what they’re missing. So I’ve put together a ‘flyby’ affair in Google Earth for ya. It’s a magical route and is going to be a great day. There isn’t much hilly stuff, but it’s still quite a challenge. You’d better have those boots worn in…. 1***Install the latest free version of Google Earth if you haven’t already. 3***Drag and drop the .kmz file you just downloaded on to the main window of Google Earth. 4***Open the folder ‘Avebury Rocks Route.kmz’ that appears in ‘Temporary Places’ folder in the ‘Places’ list on the left of the Google Earth page. 5***Click on ‘Avebury Rocks Route’ that appears underneath that. In a few seconds the walk should play before your very eyes. A pause/stop/FF/Rew control can be accessed by hovering the cursor over the main page. You can double click on the pics to see the terrain/views where you are on the map. They take a second or two to load during the ‘walk’ and then you can resume the journey by pressing play on the navigator. Otherwise you can just double click the picture title from the list on the left or the map view to see them. 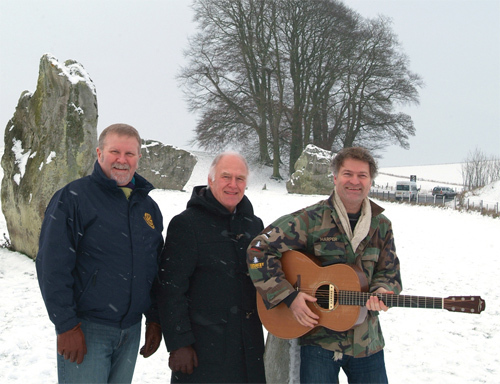 The photo shows Bob Barrett and Dave Frampton who will be President of Swindon Thamesdown Marlborough Rotary Clubs when the event takes place with Nick Harper plucking a few chords at the Avebury Stone Circle just before Christmas.